Zeus and I were playing today, and he rolled over when we were practicing tricks. When he got up, I noticed the scab that formed where his abscess ruptured and drained had come off and now he has this open wound on his back. My fault, I know. I cleaned it with hurt free antiseptic. Should I do anything else to it? Neosporin or cover it with a bandage, or just leave it be? It's not bleeding but you'll see in the pic that it's red. His hair is shaved there because the vet shaved it to see the abscess better when it was a lump. In other news...Zeus knows how to roll over on command. But no more practicing that til his back heals up all the way. I personally would probably let it be unless it is getting dirty or he is picking at it, or if it gets oozy or something that looks like an infection might be setting in. Is his skin hot around the wound; does it look swollen at all? But I'm not there in person, so I'll add that old fail-safe remark...if you're worried about it, you can call your vet and ask what you should do, or if you need to bring him in. Last edited by melbrod; 03-27-2019 at 11:35 PM. Ask your vet about applying Liquid Bandage, also known as Skin Glue. It works really well on small non-infected wounds. I cut the tip off my small finger a few days ago. A very minor injury, but in a very sensitive area, prone to contact with dirt, ect. Once the bleeding stopped, I dapped it with liquid bandage. All good now. Vetericyn gel is very good as is Coat Defense Canine. Let it be.......let it scab.......with pups my vet always states dry scab is good.......scab is natures way of protecting/healing an open wound. Do not use hydrogen peroxide ...all those bubbles .....that can cause the wound to begin bleeding again aka hemmorage. You see a white blood cell called a macrophage, takes on the role of wound protector. This cell fights infection and oversees the repair process. You might see some clear fluid on or around the wound . This fluid is helping clean out the wound. Although if you note any changes in coloration to the fluid/scab or around the wound area ........check with Vet. I would leave it alone. He's probably going to have a bald spot there unfortunately though. Thanks everyone! The area is not swollen or hot. It's already looking better today than yesterday, and all I did was clean it with antiseptic wash after our afternoon walk. Definitely will keep an eye on it and will leave it be. Fingers crossed that his fur does grow back on that spot! But he won't be loved any less if it doesnt. Good advice Lady Di and everyone else who thought leaving it open and alone except for cleaning (and warm soapy water works well. With abscesses covering them or closing them off in any way can lead to further infection--if there is anything left after the original abscess was drained if covered you can start up a nasty anaerobic infection. Clean and dry is the best thing for post drainage of abscesses. You'd be very surprised at what can heal up and leave no trace of a scar and all the hair will grow back--doesn't always happen but often it does. When I got Toad and I took down his posts to repost on the outside of one ear and oval shaped chunk of skin and hair came off with the tape. Ugh--I looked at it and told Toad that he was just gonna' have a bald spot--I taped around the spot for several weeks and was shocked to see that where it had scabbed and scab fell off leaving bare skin that I could see hair starting to grow. The hair was just a little thinner there but if you didn't know you probably wouldn't even notice. I've always been amazed how Dobes are so remarkably fast in healing & hair regrowth, from scrapes and scratches. Maybe it's their accelerated life (x7)? Like Dobebug and others and our Vet have said, open air healing is better. Our little Lanah had a blood disorder recently (low clotting factor) which caused her to lick her feet and have skin rash. I kept her feet wrapped and in booties for a week to try to heal, but she developed a smelly infection on them (even when boots and wraps changed 2x day). Solution was injected + oral medication and medicated foot bathes 2x day, prescribed by vet. 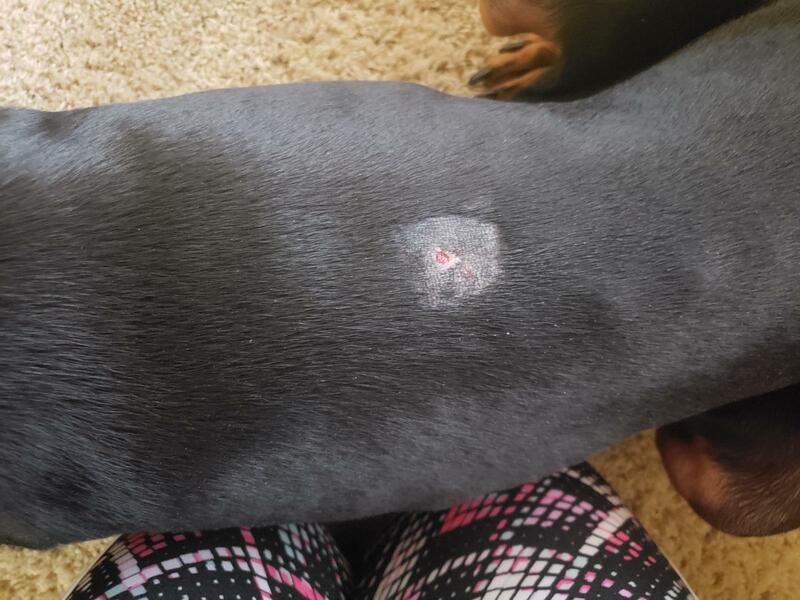 It is a topical antiseptic that aids in healing and biggest advantage is one can tell if Dobes disturb or lick off due to light color of powder. When you see the sulfur powder gone, just reapply during day. I have tried Liquid Bandage and water based equivalents, also. However these sting like heck & Dobes will pick off hard coating these bandages form. For especially troublesome wounds, like one of Spock's post surgical areas, which he picked at one month after stitches out, Spock was prescribed TresaDerm by vet. TresaDerm is topical wide spectrum antibiotic/ antifungal liquid drops applied 2x day. To apply, I would clean wound area with Hibiclens (antiseptic gel) then apply Tresaderm and topcoat with Sulphatiazol powder, using a baby Q-Tip (large tip). On initial days of this, I would put donut collars on Spock for a couple hours to keep area undisturbed. Repeated 2x day. After two days he completely stopped picking at wound and it healed up well, with 90% hair regrowth on suture area.